The Foundation has acquired for the State Library’s California History Collection a fabulous San Francisco Bay advertising poster for the Steamer H. J. Corcoran. 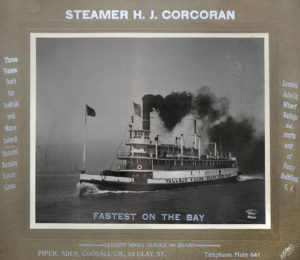 The Corcoran was touted as the “fastest on the Bay.” Built in Stockton in 1898, it ran three times daily for Vallejo and Mare Island and thence to San Francisco and the Ferry Building. The Corcoran also transported passengers for excursions up the Sacramento River to places like Rio Vista. Passengers could enjoy music and first-class dining facilities. Unfortunately, the dense fog of San Francisco Bay remained a deadly hazard for passenger and freight vessels. On February 21, 1913, the Corcoran collided with the steamer Seminole near Angel Island and both vessels “turned turtle” and rolled over. The Corcoran, now deemed old, no longer took passengers. At the time of the accident, the steamer was on its way from Antioch to San Francisco loaded with 11,000 bags of sugar and two bars of gold worth $50,000. The ship held a crew of thirty-five men. In contrast, the Seminole carried fifty passengers, a crew of fifteen, and luggage. Amazingly, no lives were lost. Alerted by the piercing sound of ship whistles, the launch Maryland and the steamer Napa Valley rescued the Seminole. The tug Angel Island also happened to be close by and saved the Corcoran’s crew. The strong currents of the Bay swept the Corcoran out through the Golden Gate, but another launch managed bring her back to safe waters. The stern-wheeler was rebuilt and renamed the Crockett in honor of the town on the Carquinez Straight and remained in service until 1944. The advertising poster itself is certainly eye-catching showing the Corcoran gliding over San Francisco Bay with massive plumes of smoke trailing behind. J. D. Givens of San Francisco made the silver gelatin print which measures 14 x 17 inches. The mount is lettered in silver and measures 24 x 26 inches.